Sometimes you realise that the domain name you are using just doesn’t fit anymore. Maybe you have changed direction in your life or you feel that you have outgrown your name. In May 2018, I decided to change my domain name from The Barefoot Travellers to The Silver Nomad as it fitted more with me and my lifestyle, and the silver beginning to streak my hair! I was recently asked how I went about changing my domain name and moving my WordPress site over. 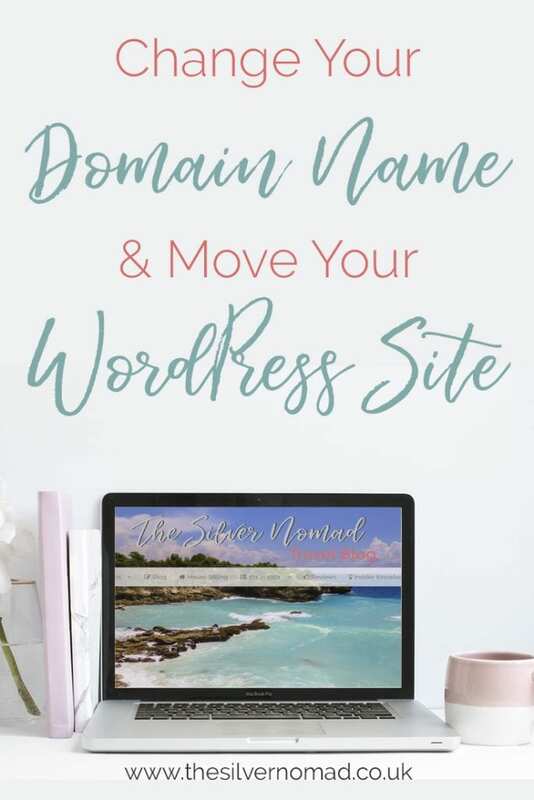 There are many ways to do change move your WordPress site to a new domain but here is the process that I used. When you are going through the process of choosing a new name for your blog, it is worth checking if it is available as a domain name and across the social media platforms you are going to use. I use Who.is to check the availability of domains. You may have to tweak your choice if the domain you want is not available, maybe add “the” at the front, “blog” at the end. I had to add “blog” onto the end of my Facebook and Instagram names as thesilvernomad had already been taken. The most common domain extension is .com, but don’t rule out other ones like .co.uk or your own country’s domain. You could actually get a .blog domain extension if you want, though they tend to be a bit more expensive. If you already have a website, you probably either manage your own domain name registrations and hosting or have a web developer/friend/guru who does it for you. If you don’t have a host, there are many about, some better than others. I personally have used Fasthosts for many years without complaint. Make sure whichever hosting package you go for supports WordPress. Once you have registered your domain and added the hosting package, it might be worth setting up a secure layer https:// to make sure your site has an extra layer of security. Your host should be able to help you with this. Make sure that you have WordPress installed – depending on your chosen host, you may have to pay a bit extra for this. Once WordPress is up and running, the fun can begin! I use ManageWP to monitor, back up and clone my sites. It is free to sign up, but to back up and clone your there is a small monthly charge of approx £1.55 per site. I think it is well worth it for daily backups and the ability to monitor my domains. Both domains need to be added to the dashboard, but before you can do that you need to add the Worker plugin to both sites. Once the plugin is installed and activated you can then add the domains to the dashboard. Once added, the domains will be backed up. You can then use the Clone tool to clone the old site to the new domain. In the past, I have also used Duplicator when I have been testing or redeveloping sites, but now I find ManageWP easier to use and has many more functions. Now you have your site set up on your new domain, you can start checking the site and making any changes you need. You may want to change your theme and colour scheme to match with your new logo. This may change the look of your posts, so it is worth checking before you go live. You could stick with the theme that you already have and know that everything will look as it was on your old site. This is a great time to look at all your plugins and see if you really need them all. Are you duplicating any functions or have plugins that you read about and added but can’t remember why? Yes I have been guilty of that! Go into Settings then Permalinks and make sure that they are set to the way you like your posts to be saved. I always go for the Custom Structure and chose /%category%/%postname% which is better for finding post than using the date structure. Go through all your posts and make sure that your links are still working, update any internal links and connections to your media. I used Link Checker and Broken Link checker to highlight any problems with my links and where links to the old site were still mentioned. I also changed all my Pinterest images to include the new domain name. If you have the time, reread all your posts and maybe give them a refresh or delete them if you feel they don’t fit with your new domain. Don’t forget to connect your new Social Media feeds and update them to reflect your new domain name. Once I was ready to launch my new site, I set up the Redirection WordPress Plugin. This wonderful little plugin redirects all the pages and posts from my old site to their corresponding pages on the new site and keeps stats for them on the old site. I hope this guide has helped you with moving your domain. Please feel free to ask any questions or contact me if you would like me to quote for moving a domain for you.